Acupuncture involves placing tiny needles under the skin at specific points in order to stimulate the body’s ability to heal itself. Acupuncture is a very safe form of medicine. Because it depends on the body’s ability to heal itself, acupuncture cannot make a problem worse. Acupuncture is so ancient that no one knows for sure where or how it originated. Nor does acupuncture fit well into any biomedical paradigm. Acupuncture has been practiced for so long in so many places that there are an almost infinite variety of ways to do it. The most important thing about acupuncture is not why it works, but how amazingly well it works. Acupuncture is effective for an enormously wide range of conditions, so wide that it is likely that it will help almost any problem to some degree, even if it can’t cure it entirely. People use acupuncture to manage the daily stress of modern life; to ease aches, pains, and strains; to fend off colds, flus, and allergies; to sleep more restfully; to cope with chronic health conditions; to regulate hormonal cycles; to get support in making healthy changes; to recover from injuries and surgery; to reduce joint and muscle inflammation; to improve digestion; to feel more like themselves again. Besides being effective for a lot of different specific conditions acupuncture is beneficial in some general ways for everyone: it usually improves sleep, energy, and mood. Seminole Heights Community Acupuncture is one of over 200 community acupuncture clinics that have opened across the country. Our goal is to provide care to as many people as we can. The care we provide is top-notch and we offer authentic, traditional acupuncture. We believe acupuncture doesn’t have to be expensive to work. In fact, we think affordability is essential to good care. Acupuncture is a process and works best when people are able to commit to a course of several treatments. Because of the lower fees and sliding scale that community acupuncturists charge, our clients are more able to make this commitment to their healing. Affordability, community and individualized care are what distinguish community acupuncture from other types of care. We offer acupuncture on a sliding scale of $15 to $40. Acupuncturists in other settings see only one patient at a time and charge $65 to $175 per treatment. And for their patients it’s because of its cost, patients make the hard decision to stop coming in as often as they need to get well. In a community setting like ours, several people are treated at the same time so costs can be lowered. And we leave it up to our patients to decide what they can afford. No proof of income is ever requested. At our clinic here in Tampa we use recliners, clustered in groups in an open, quiet, soothing space. Treating patients in a community setting has many benefits: it’s easy for friends and family members to come in for treatment together; many patients find it comforting; and a collective environment is established by the group treatments making each individual’s treatments more powerful. We take acupuncture back to its roots and treat patients in a setting similar to how acupuncture is traditionally done in Asia. 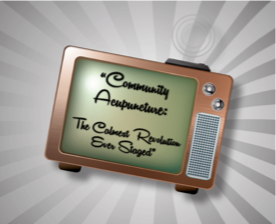 Community style acupuncture allows patients to keep their needles in as long as they want. Most people learn after a few treatments when they feel “done”; this can take from twenty minutes to an hour! Many people fall asleep, and wake feeling refreshed. This way of practicing takes the emphasis of healing off of the practitioner and places it on our body’s abilities to heal itself once needles are placed and a person is allowed to relax in stillness and quiet. Gururas Khalsa has practiced and taught acupuncture & Chinese medicine since 2002. Gururas specializes in pain related conditions as well as women’s health. She trained to be a direct-entry midwife focusing on out-of-hosptal births and has assisted midwives at births in both birth centers and at home. Gururas teaches Kundalini Yoga and meditation. More about Gururas. Seminole Heights Community Acupuncture is part of a nationwide movement to fix health care. We're members of a national co-op, the Peoples Organization for Community Acupuncture, a group that is helping bring clinics like ours into existence. Patients and acupuncturists alike are members of the co-op; anyone can join! Building community is essential to our clinic. Stress, pain and illness are isolating. When you come for care you'll notice other people receiving treatments in the rooms with you. People are quiet during their treatments and in all likelihood you'll never know the names of the people or why they come for care. But over the years we've found that treating in a community setting makes acupuncture more effective. Group treatments like ours are common in Asia. And it makes it easier for us to see the volume of people we need to keep our prices low. And for patients to bring their family and friends along, too. Often patients enjoy the space so much they want to become more involved in the community: they join POCA, the Peoples Organization for Community Acupuncture, and find our ways to contribute by volunteering and getting involved. If you're interested in helping out, just let the front desk staff know. Communities like ours are always growing. For more information about the community acupuncture movement and POCA click here. Folks Who Work Outside in Agriculture & Landscaping get Unlimited $10 Acupuncture ALL Month!